At Microsoft’s annual TechEd conference for developers and IT pros, was announced that Windows Phone will see a major change in its capabilities in its next version named "Mango” and supposedly will release later this year. The features are meant to provide a productive edge on the go to users. Facebook Chat will be available along with Windows Live Messenger. Adding the ability to save and share Office documents through Office 365 and Windows Live SkyDrive, ensuring one has access to the latest documents. Pinnable email folders: Pin a folder to the start screen for quick access. This could be an email folder for a specific project, from a specific group or person. Server search: one can search his/her email server (e.g. Exchange Server) for older emails (other than the 10-15 stored in the phone) giving ready access to all of the mails. One can now be able to group phone contacts together. Support for hidden corporate Wi-Fi networks. These features really sound promising. There are more of the features to be revealed in near future. 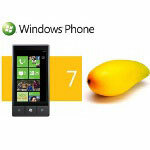 Certainly, this time Windows Phone has planned to take the market by storms. Lets wait and watch till the phone hits the market.